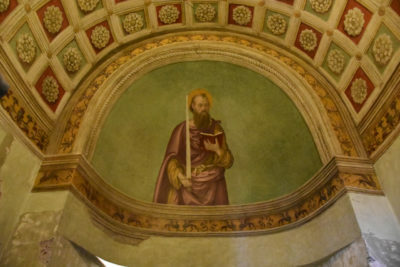 As announced this Spring, we completed our restoration project, The Fresco of St. Paul. We were just informed that the fresco restoration cost less than anticipated and that there was an excess amount of 9,431 Euros. During our Chapter visit to Rome in June, the restorer showed us, located just below the newly restored fresco, a layer of green paint on the walls with the original decoration still present underneath. Restoring that area would complete the entire niche. Romina Cometti, our restoration projects manager, asked if we would consider donating the excess funds to complete the entire area. Once that request was made, the members of the DC Patrons board voted unanimously to donate the extra money to the amended project. His Eminence James Cardinal Harvey, Archpriest of the Basilica of St. Paul Outside the Walls, expressed his gratitude for the soon to be completed project.